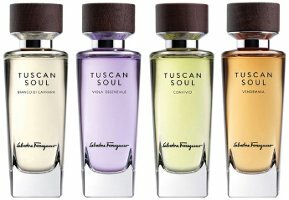 Salvatore Ferragamo will launch the Tuscan Soul Quintessential Collection, a new quartet of unisex fragrances — Bianco di Carrara, Vendemmia, Viola Essenziale and Convivio. The Tuscan Soul Quintessential Collection scents are flankers to 2008's Tuscan Soul. Bianco di Carrara ~ developed by perfumer Lucas Sieuzac and inspired by Carrara marble; the notes include neroli, white pepper, vetiver, fig, white musk and tonka bean. Vendemmia ~ developed by perfumer Fabrice Pellegrin and inspired by Tuscan vineyards; notes include citron, grape, peach, fig, jasmine, sandalwood and tonka bean. Viola Essenziale ~ developed by perfumer Sonia Constant and inspired by Tuscan iris; the notes feature lychee, neroli, iris, orange blossom, patchouli and musk. Convivio ~ also by Fabrice Pellegrin, and inspired by the Tuscan "heritage of sharing", with grapefruit, carrot seed, cypress, jasmine petals and cashmere wood. Salvatore Ferragamo Tuscan Soul Quintessential Collection Bianco di Carrara, Vendemmia, Viola Essenziale and Convivio will be available in 75 ml Eau de Toilette. They launch next month; look for them to reach the US in February of next year. These really don’t grab my attention at all. Tuscan Soul is such a boring name too. I didn’t much care for the original. These could be better, who knows. I think the original did well. Those are some underwhelming bottles. they look like a less pretty version of the Yves Rocher Secret d’Essences bottles. Hope they will be worth it! Of course I will try them too, if I ever see them.